It’s 10AM on a rainy Saturday morning in Worcester, my son is waking up from his nap; what to do? Luckily I remembered that the Worcester Art Museum has FREE Saturday morning admission thanks to the TJX Companies from 10AM to Noon! (WAM admission is always free for ages 17 and under). 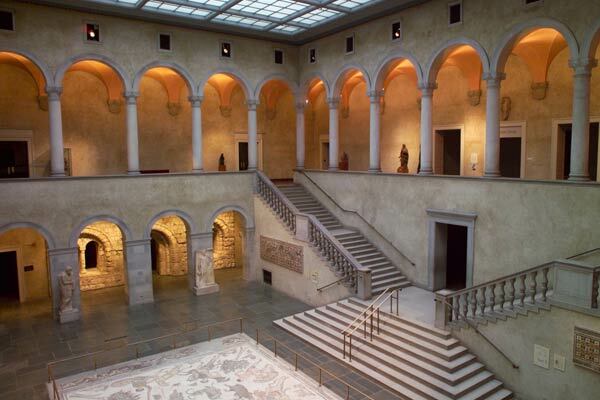 So when Baylen awoke we hopped in the car and a few minutes later were at one of the best art museums in New England. What would an almost 8 month old child get out of an art museum you might ask? Well let me tell you, he was AMAZING! As we entered we were greeted politely and just had to give our zip code and we got a map of the museum and were on our way. Entering the Atrium his eyes scanned the high glass ceiling of the Renaissance court. We first went to the roman section and he sat quietly in his stroller observing each piece as we passed. I would stop in front of pieces that he was particularly interested in. Next we went to the into the Chapter House, an actual section of a 12th century Benedictine Priory from France complete with vaulted ceilings and stained glass windows. Bay was quite impressed. We took the elevator upstairs to the second floor and walked around the Renaissance court Balcony. Naturally my almost eight month old son was particularly interested in the sculptures of Madonnas with child, as well as the full suit of armor. We entered the European galleries where after a good while Baylen shook his head NO! to the abundance of Dutch still life. We were lucky to catch the Rona Pondick exhibit which concludes October 11th; a fascinating juxtaposition of sculpture from the museum along side creations of the artist. Baylen was intently eyeing this exhibit. Even the curator remarked how Bay seemed to be taking it all in and suggested that maybe he’d grow up to be an artist! The atmosphere of the museum is relaxed and not hurried. It’s surprisingly large but very intimate and approachable for a day trip. There is a cafe’, Museum shop, and Library, as well a number of studios for classes that are offered. My wife and I had considered the museum as a possibility for our wedding a few years back as the event staff and facilities are top notch. The museum has two smaller floors upstairs with American and Pre-Columbian art which we did not see today, but as we sat on a bench along the renaissance court, Bay sipping his bottle, we both agreed we’re coming here again.